Community college, also commonly referred to as two-year college–is anything but. Whether it’s because of financial issues, “second chances” or any of the multitude of reasons, students attend community college with the hope that they will soon move on to something better: a four-year institution or a career. This is even advertised as achievable in two years. Certain units, such as mandatory, at times irrelevant, general education requirements, and technicalities, such as non-transferable courses, however, make that difficult. Graduating late is a problem across all higher education institutions. Reducing the amount of time it takes for community college students to graduate or transfer will significantly reduce six year graduates in four-year colleges. By reducing general education requirements, or getting rid of them altogether, students can focus on their major or area of study and achieve their goals quicker. Pierce could also offer more in depth counseling and network more closely with other schools to provide the most accurate, specific articulation agreements for students to follow for their college of choice. Students are encouraged to transfer to a four-year college with 60 units to have junior status. Of these 60 units, half are allotted to general education and the other half are allotted to the student’s major, ideally. These units are typically expected to be accumulated in the course of two years, 15 units a semester. Assuming the student attends college full-time, they can knockout general education in a year. The National Center for Education Statistics reported in 2013 that 69 percent of community college students work while attending college. Some students can’t attend full time and have to dedicate more time to complete classes they will hardly ever need. Additionally, because general education is required for most students, these classes are the most sought after and fill up quickly. Students are not able to enroll in the classes they need and have to wait longer to fulfill requirements. According to the Department of Education, 23 percent of community college students graduate in three years, while a majority graduate in five. Community colleges entice students with low tuition rates. According to the College Board, average in-state tuition for community colleges in 2014–2015 was $3,347. Compared to the average tuition at Universities of California, which is $12,240, $3,347 seems quite reasonable. Community college tuition is 1/4 the rate of UC tuition, but one common pitfall diminishes the frugality and increases time wasted. Not all classes are transferable to the UC system, some are not even transferable to the California State University system. Paul Attewell and David Monaghan, researchers of the Graduate Center of the City University of New York, reported in 2014 that 58 percent of community college transfers were able to bring 90 percent of their units, while 14 percent of transfers lost 90 percent of their units. 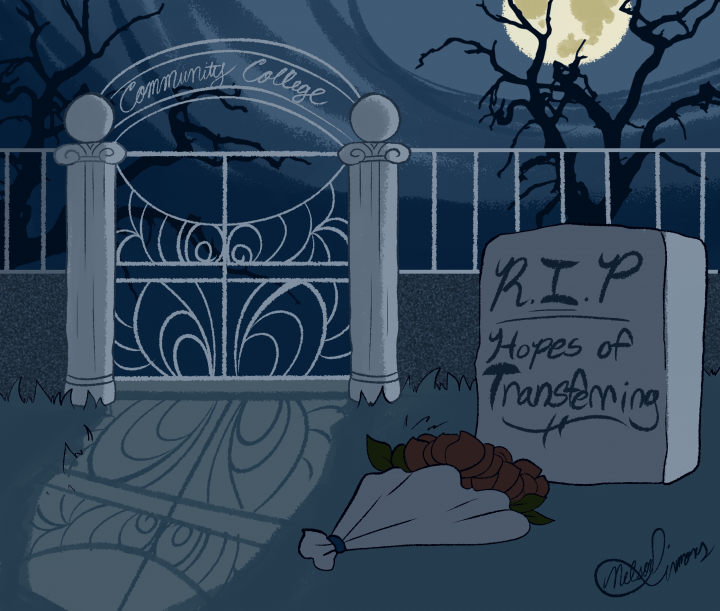 Though more than half of students are able to transfer the majority of their community college units, many enroll in a four-year college needing to make up the credits that were lost. Students would have to retake a low-level course in an institution with a higher tuition because the community college course taken previously, did not satisfy specific requirements. Students lose hours of course credits and hundreds of dollars and end up having to spend even more money on higher tuition per year because they can’t graduate on time. Escaping the community college system does not end all problems. By the time a student transfers, they may still be behind. After transferring from a two-year college with 60 units, 3 to 5 years later, to a four-year college, a student may expect to obtain a bachelor’s degree in two years. According to figures released by the College Board in 2009, this is not likely to happen, in fact, it takes college students an average of 6.2 years to complete a four-year college education. According to the Department of Education, less than 40 percent of students graduate college in four years while 60 percent graduate in six years. Though graduating late is a problem across all higher education institutions, reducing the amount of time it takes for community college students to graduate and/or transfer will significantly reduce six year graduates in four-year colleges. By reducing general education requirements, or getting rid of them altogether, students can focus on their major or area of study and achieve their goals quicker. Pierce can also offer more in depth counseling and network more closely with other schools to provide the most accurate, specific articulation agreement for students to follow for their college of choice.